Mary was surprised when she found her boy in the temple among the wise men. AZARETH, THE BOYHOOD of Jesus, was nearly seventy miles from Jerusalem. The Jews who lived in this city could not go every week to worship God at the temple, so they built a house of worship, called synagog, in their home town. Here they attended religious services, and listened to the reading of the books written by Moses and by the prophets. As a little boy Jesus lived in the humble home of Joseph, the carpenter, and played among the shavings that fell from Joseph's bench. He also like to run about and play in the warm sunshine, as little children do today. But when he grew old enough to go to school his parents sent him to the synagog, where other Jewish boys were taught to read and to write. We are sure that Jesus studied his lessons well, and that he gave careful attention to the books he read each day. These books were copies of the Psalms and of the writing of Moses, the lawgiver, and the prophets. Like other Jewish boys, he learned to repeat many of these scriptures from memory, for he never had a Bible of his own. One spring morning after Jesus was twelve years old a company of Jews started from Nazareth to attend the Feast of the Passover, at Jerusalem. Every year since their return from Egypt, Joseph and Mary had attended this feast, and now, as usual, they were in this company. But this time they were taking with them the boy Jesus. Other children, too, were going, and they would enjoy the long trip of nearly seventy miles much more than would their parents and grown-up friends. As the company moved slowly along the road, other Jews from cities and villages near by joined them. And when they came to Jerusalem they met people from every part of the land. What an exciting time this much have been for the children! How wide their eyes must have opened when they saw the beautiful temple on Mount Moriah, with its wide porches and immense pillars of stone! And perhaps they stayed close by their parents during the first days of the Feast, lest they should get lost in the throng of people who daily crowded the temple courts. Jesus enjoyed this Feast as much as did this parents and grown-up friends. Although just a child, he was beginning to realize that God was his Father, and that he must work for God. So he listened to the readings of the law, and to the words of the chief priests and scribes, who taught the Jews every day. But we are sure that he acted very much like a healthy twelve-year-old boy, for his mother did not notice how deeply interested he had been in the services at the temple. After the Feast had ended, the company started on its homeward journey. Mary did not see her young son; but since she supposed that he was among their kinsfolk and friends, she did not feel uneasy. However, when at evening he did not come, she and Joseph began to search for him. All through the company they went, asking about Jesus; but no one had seen him that day. Then they turned with anxious faces back toward Jerusalem, and for three days they searched for their missing child. On the third day they found him, not playing with other boys in the streets, nor learning to swim in the Pool of Siloam, but sitting in the temple among the wise teachers, and asking them questions, which they could hardly answer. Mary was surprised when she found her boy in the temple among the wise men. She had looked every other place for him. She knew he was a boy, just a boy, and she was surprised to find him so deeply interested in the teachings of God. She came to him and said, "Son, why did you stay here when we were starting home? Your father and I have been anxiously seeking for you everywhere." Jesus answered, "Why did you seek for me? Did you not know that I must be about my Father's business?" He meant, "Why did you not know where to find me at once? For I must be about my heavenly Father's business." But Mary did not understand, though she wondered much about the meaning of his words. 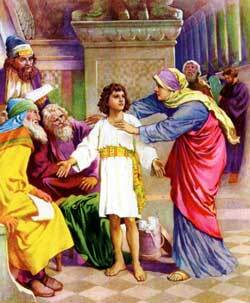 The wise men in the temple had been much surprised to hear the wisdom of the boy Jesus. They had gathered round him to ask questions that only wise persons could answer. And Jesus answered them, every one. But when Mary and Joseph came to the temple, Jesus left the teachers there and returned with his parents to Nazareth. He was an obedient child, and as the years passed by he grew into a noble young man. Not only did he learn how to explain the Scriptures, but he watched Joseph at his work until he, too, became a carpenter. And by his kind, thoughtful ways he won many friends. In this humble home in Nazareth, Jesus lived until he was about thirty years old.